Springtime (that wacky southern hemisphere!) means outdoor sports season. 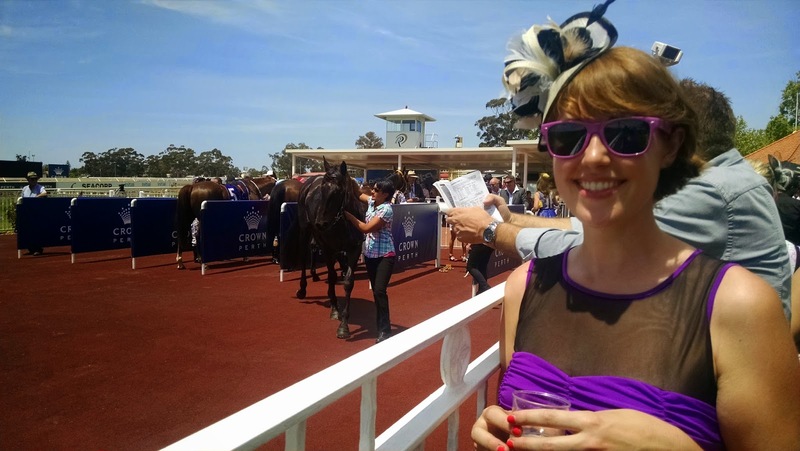 I was invited by my new friend Nat to join her for a ladies day out to celebrate the Melbourne Cup, essentially Australia’s Kentucky Derby. 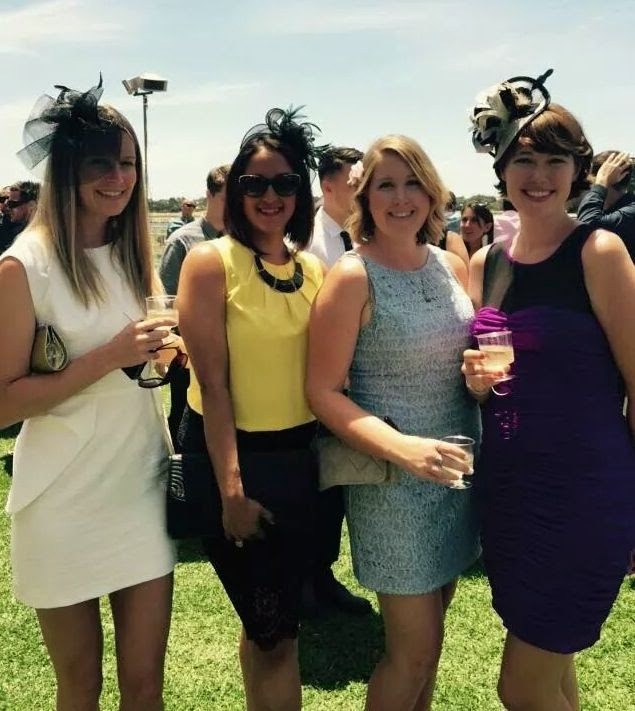 We attended at Ascot Racecourse in Perth to partake in local races and observe the broadcasted national spectacle. 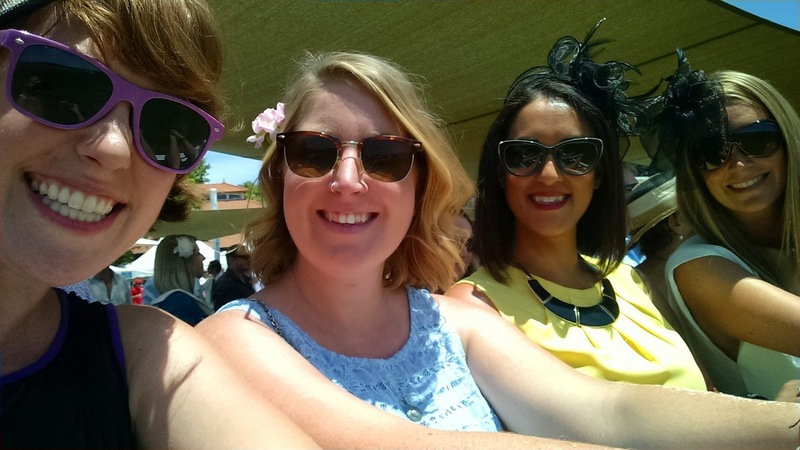 All dolled up for a day at the races! We arrived just in time for the Melbourne Cup race #7, the premier race of the day. With bated breath we bellied up to the rail and watched the race on the track bigscreen. There was a large sheltered area housing all the official and independent booking agents, each offering different odds. 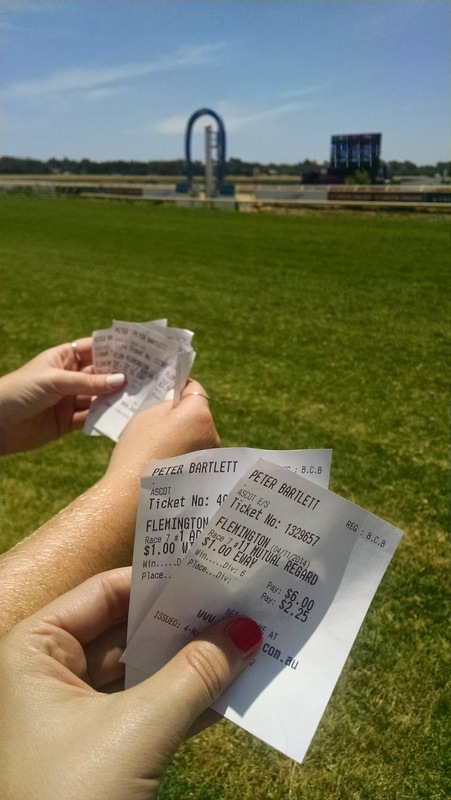 You pick your horses, then go shopping for a bookie to place your bet! I bet on the favorite and the hometown jockey going for a record. 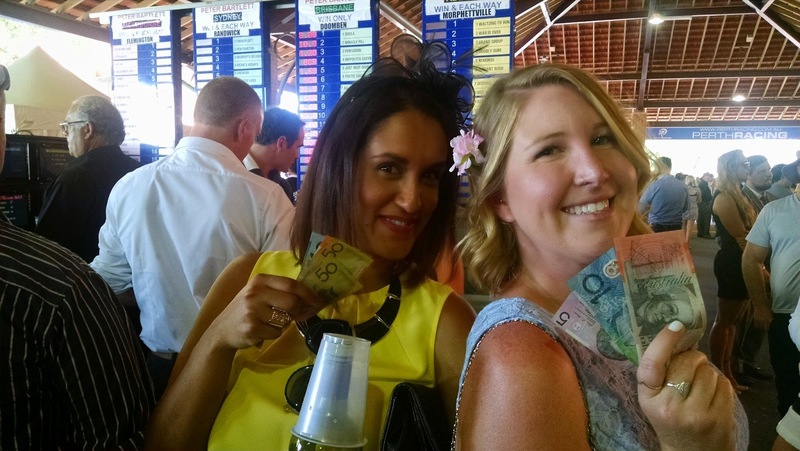 Nat and Mel placed last minute bets on horse number five, Protectionist, based on a random tip that a man in the train station shouted at us while we poured over the betting sheets in the newspaper. It turned out to be a winner! First round of drinks were on the winners. For a captive audience, drinks were reasonable: $25AUD per bottle of house SSB, Semillon Sauvignon Blanc. (Pro tip: pack a picnic to go with your wine.) We weren’t the only ones drinking however. As the afternoon progressed, I saw an all-out fist fight break out one table away. When we took the crowded bus home at the end of the day, one man verbally reprimanded a second man for not giving up his seat to a woman. When man #2 continued to sit, man #1 smacked him in the face! I’m not used to arguments getting physical so quickly. My Australian lady friends rolled their eyes. Oh, the fighting, what an annoyance. A distasteful reality. To me, it was startlingly bizarre. Overall, it was a lovely Tuesday in the sun with wonderful company, and an enjoyable cultural experience indeed! On a somber note, there were some unfortunate fatalities: two horsed died. We found out the news after leaving. One–Admire Rakti–was the favorite in the main race but suffered heart failure immediately after. An uncommon, but not unheard of, accident. A second horse in another race got spooked by a flag-waving fan, shattered its leg, and was euthanized shortly thereafter. Finally, after nearly 24 hours in the air and two days in Singapore, I landed in Perth, Western Australia. Nick, one of my best travel buddies from Central America, warmly welcomed me at the airport. On the drive home, he told me–surprise–we’re moving house tomorrow! Well, let’s jump on in then. It had been a year since I last saw him, so we enjoyed a quiet night in catching up before the big day following. I awoke early my first full day in Australia. I heard the sound of the birds outside and could not sleep from curiosity. Kookaburra say what? I am not usually a morning person, so when jet lag gives me the gift of being awake at unreasonable hours I take advantage: I watched the sunrise cast light on Perth CBD (“central business district”) across the Swan River. 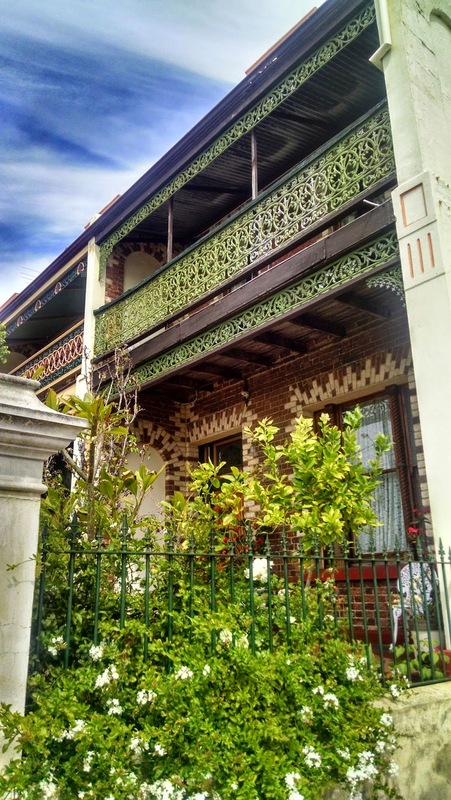 After a quiet morning wifi-ing at a cafe–where I took my first step toward employment by applying for my Australian Tax File Number–we got to work and moved house from Victoria Park to the new digs in Fremantle. 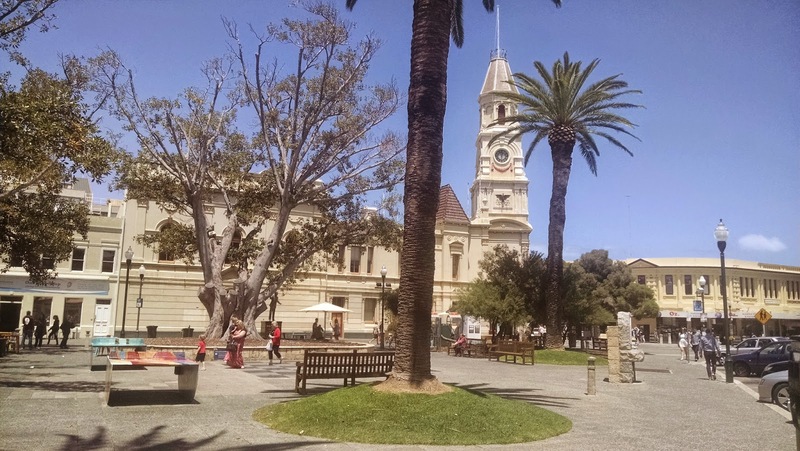 “Freo” is a seaside village, historically a port town and now a southern pleasant southern suburb of Perth known for easy going cafe culture. Some of the buildings display delicate and colorful wrought iron facades that remind me of New Orleans. Fremantle town hall plaza, with free wifi! The town overlooks the Indian Ocean, with a few beaches I’m sure to frequent this summer. 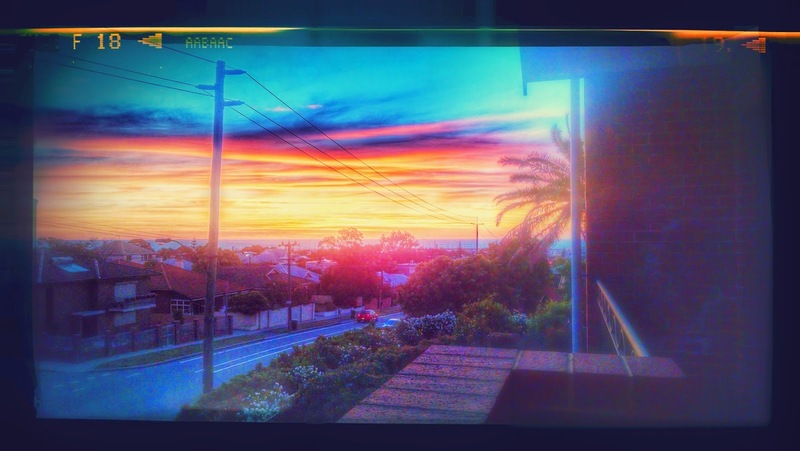 The strong ocean breeze, nicknamed the “Freo doctor”, is a constant presence that howls past my house daily. Downtown’s Cappuccino Strip is littered with pubs, cafes, and shops. Nightlife looks lively. I feel lucky to have landed here. Particularly in this household. I’m staying in my friend’s beautiful townhouse that has a view and a healthy stream of houseguests. The new furniture has been built, we’ve developing house rhythms, and are preparing for Thanksgiving and a housewarming party. It holds promise to be a pleasing place to live. Sunset from our new “Terrace del Sol”, looking down to the Indian Ocean. It is time for my next adventure! One year ago, I returned from Central America, thrilled with traveling and hungry for more. 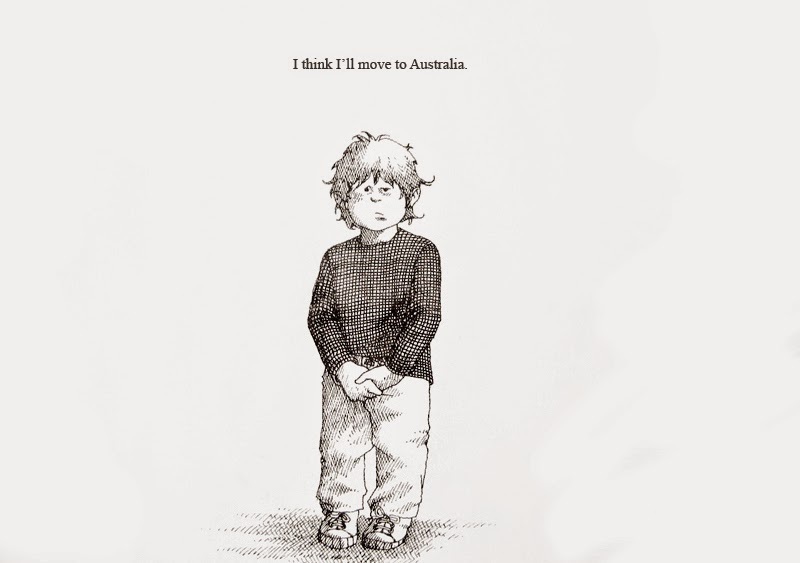 So I secured a Working Holiday visa to travel and work in Australia for a year before I (a) turned 31 and ineligible, and (b) my traveling can-do spirit was tempered. It has been a ticking time bomb in my pocket ever since. After a year in Seattle, I’m finally taking the plunge and bought a ticket to Perth, Western Australia. There’s nothing like the nerves right before pushing the “purchase” button for an international flight. I learned from my past mistake: when going on adventures, never book round-trip. Anything can happen, don’t overly plan if you don’t have to. So many questions, yet I take solace: seems like a sign that I’m moving from one WA (Washington State) to another (Western Australia) and upon my arrival one of my favorite people is taking me on as a houseguest to soften my landing. Plus, the weather report for Perth looks drop dead damn gorgeous. [Deep breath.] Here goes nothing! Alexander from “Alexander and the Terrible, Horrible, No Good, Very Bad Day”.